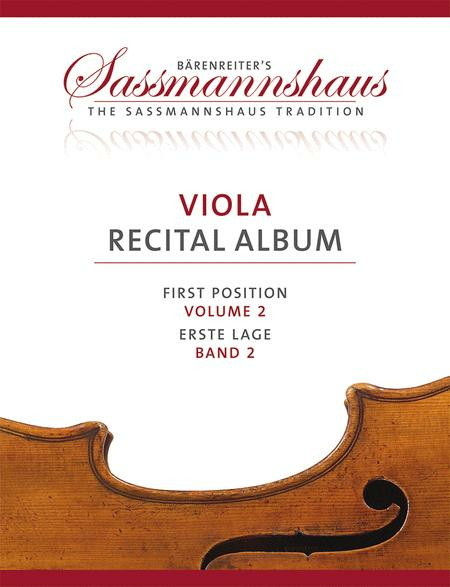 9 Recital Pieces in First Position for Viola an Piano or Two Violas. Edited by Lusk, Melissa / Sassmannshaus, Christoph / Sassmannshaus, and Kurt. Stapled. Barenreiter's Sassmannshaus. Performance Score(s), Part(s). 12/14/9 pages. Baerenreiter Verlag #BA08991. 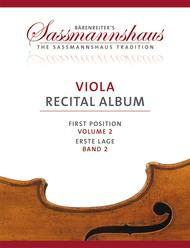 Published by Baerenreiter Verlag (BA.BA08991). ISBN 9790006565665. 30 x 23 cm inches. With an additional viola part for duet version. Children playfully learn reliable technique at the earliest age. For more than three decades the Sassmannshaus Tradition has been the household name for excellence in beginner methods in German-speaking countries. More than half a million students have successfully learned to play using this publication. This tried and tested German method is now available in English! The best-selling method that gave generations of European musicians their foundation is now available in English, with content and songs newly adapted for today's English speaking children. What makes this method so special? The child-friendly and age-appropriate text underlying the music enables children to perceive melodies as a whole and to understand their singable qualities. Songs and scales in different positions are easily explained and mastered within the first year. This is an important advantage over methods that confine children to the first position for many years. Note reading is emphasized from the first lesson - children are brought up to become proficient sight-readers and play in chamber music ensembles as early as possible. In contrast to other beginner methods, The Sassmannshaus Tradition progresses swiftly by introducing advanced techniques in rudimentary form, such as shifting and varied bow strokes. Ensemble playing is encouraged from the very beginning. The method is suitable for single instruction as well as for group and class lessons. The large print notes and text as well as many colorful illustrations are particularly child-friendly and very attractive to pre-school children and school children alike. The substantial volumes contain comprehensive material and carefully calibrated learning curves. They keep children curious and interested for many months and years.